Chris Griscom is a Global Spiritual Leader, Visionary and Advocate for Humanity. Ms. Griscom's lifelong work has been to elevate Human Consciousness through conscious technology, advancing all mankind as global and cosmic citizens. Currently, Ms. Griscom is leading the Global Warming & Conscious Solutions Initiative, a global initiative that utilizes the technologies of consciousness she has designed to re-balance the greenhouse gases and our atmosphere--restoring our Planet through global conscious intention. Focusing on Human Potential and Global Responsibility, the immediate goal of this initiative is to bring together people from all walks of life, cultures and nations to discover that together we can find a greater purpose and direction for the human spirit. Ms. Griscom began her work of Human outreach in the diplomatic service of the Peace Corps, joining the first wave of volunteers to bridge the gaps of cross-cultural understanding and education in developing countries. Throughout a lifetime of work in the field, she has inspired and touched millions across the globe. Ms. Griscom is the recipient of numberous international awards for her global endeavors, which include the International Swami Vivekanad World Peace Award, presented to her in Rajasthan, India by the Prahari Organization for Inspiration and Global Peace. She has been recognized five times by The Indian Board of Alternative Medicines, based in Calcutta, India. The Board awarded Ms. Griscom the Sewa Chakra Award, past recipients including the late Mother Teresa and the Dalai Lama. In addition, she has been awarded with the International Healing Award for Excellence in a Lifetime of Service to Humanity, presented to her in Calcutta. She was the only woman and the only United States citizen to receive this award. The IBAM has further honored Ms. Griscom by bestowing upon her the title Mahatma, meaning "Great Soul." In the United States, Ms. Griscom has been nominated for the prestigious Templeton Prize by a United States Senator and a U.S. Congressman. Contributing locally, Ms. Griscom was instrumental in the passing of the Peace Memorial for the State of New Mexico. Chris Griscom has founded several institutions that focus upon the uplifitng of Humanity and its role as guardians in our world: The Sanctuary of Light and The Nizhoni Institute for Global Consciousness, as well as the internationally acclaimed Light Institute of Galisteo. She has authored many books, that have been translated around the world, on subjects of higher consciousness and Human potential. 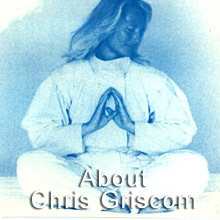 Chris Griscom has devoted her life to the development of spiritual technology, the expansion of consciousness and the evolution of the Soul. She travels the world giving talks and seminars, while continuing her work at The Light Institute.